JR Bertuccio is hoping that his hot start to the 2014 NASCAR Whelen Southern Modified Tour campaign is a sign of things to come. Bertuccio, from Centereach, N.Y., entered the season with two top-five finishes in 26 career Whelen Southern Modified Tour events, and has doubled his total just two races in. He posted a then-career-best third place finish in the opener on March 9 at Caraway Speedway in Sophia, N.C., and followed that with his first tour victory on March 15 at Southern National Motorsports Park in Lucama, N.C. The 33-year-old driver hopes that his last two races are indicative of what fans can expect from him in 2014. Bertuccio heads to Caraway for the Prestoria Farms 150 on Saturday, March 29 with a one point lead over Andy Seuss in the championship standings and five points over three-time defending champion George Brunnhoelzl III. Over his last four starts at the track, Bertuccio has three top-five finishes and four top 10s, with an average finish of 5.3. "We were great at Caraway last time,” Bertuccio said. “Believe it or not, we found some stuff with the race car and can't believe we finished third. I think we'll be better than we were last time at Caraway, so, I can't wait." The Prestoria Farms 150 will be the second of six tour dates at Caraway this year, and the 50th overall event for the southern modifieds at the track. The Race: The Prestoria Farms 150 is the third race on the 2014 schedule for the NASCAR Whelen Southern Modified Tour, now in its 10th season. It will be the 50th running of the tour at Caraway Speedway. The Procedure: The maximum starting field is 26 cars, including provisionals. The first 23 cars will qualify through two-lap time trials. The remaining three spots will be awarded through the provisional process. The race is scheduled for 150 laps (68.25 miles) with a 10-minute break at or near the conclusion of Lap 75. The Track: Caraway Speedway is a .455-mile banked asphalt oval located in rural Sophia, N.C. The facility opened in 1966 with a dirt racing surface and was paved in 1972. Caraway, which features NASCAR Whelen All-American Series-sanctioned events on Saturday nights throughout the racing season, has hosted more NASCAR Whelen Southern Modified Tour events than any other track in the tour’s history. Race Winners: There have been 11 different winners across the 49 previous Whelen Southern Modified Tour events at Caraway, led by George Brunnhoelzl III with 10. Pole Winners: Seven different drivers have earned Coors Light Pole Awards at Caraway since the inaugural event in 2005. Burt Myers leads that contingent with 13. George Brunnhoelzl III holds the track qualifying record at 15.648 seconds and 104.678 mph, set on April 21, 2012. Golden Race at Caraway: Saturday’s Prestoria Farms 150 will be the 50th NASCAR Whelen Southern Modified Tour event at Caraway Speedway. Brian Loftin, Junior Miller and L.W. Miller were the kings of Caraway in the first four years of Whelen Southern Modified Tour action as they combined to win 17 of the first 21 events there. The subsequent five seasons have seen George Brunnhoelzl III and Andy Seuss account for 19 victories in the last 27 trips. Seuss Looks to Extend Caraway Streak: Andy Seuss has joined elite company with wins in each of the last three Whelen Southern Modified Tour events at Caraway. The run, which was extended by a wire-to-wire win in the opener there on March 9, has matched Junior Miller’s Caraway win streak from 2006. L.W. Miller’s five consecutive conquests from 2006-07 remains the record mark for Seuss to chase. Brunnhoelzl Dominant at Caraway: Brunnhoelzl has won one out of every five races at Caraway in Whelen Southern Modified Tour history. His record 10 triumphs at the track have all come in the last 25 events there dating to mid-2009. Since that first win in 2009, Brunnhoelzl’s run has been so dominant that in the 15 events that he didn’t win, he was runner-up nine times and finished outside the top five only twice. JR Bertuccio earned his first NASCAR Whelen Southern Modified Tour victory in the Southern National 150 on March 15 at Southern National Motorsports Park in rural Lucama, N.C. The 32-year-old from Centereach, N.Y., had to hold off four-time tour champion George Brunnhoelzl III on a green-white-checkered finish for the victory. 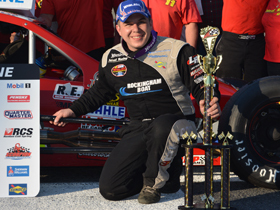 The win came in Bertuccio’s 56th career start between NASCAR’s two Whelen Modified Tours. The NASCAR Whelen Southern Modified Tour will get right back at it next week with the South Boston 150 at South Boston (Va.) Speedway. Brunnhoelzl III has three top fives and four top 10s in five career starts at the .4-mile banked oval, including a victory in this event last year. Andy Seuss hopes to keep his Caraway success going.